A great way to explore both the Argentinian and Chilean Lake District in just 7 days, averaging around 40 miles a day on rough tracks. You'll see some of the regions most dramatic volcanoes and most beautiful lakes, and sleep under the stars in beautiful locations on a few of the nights. You will be met at San Martín de los Andes airport, from where you will transfer to your hotel in the town. An opening meeting will be held with the tour leader before discovering the charm of the town on a guided tour. In the evening, share a welcoming dinner as you get to know your fellow travellers. After breakfast at the hotel, begin the ride over different circuits in San Martín de los Andes We tune our mountain bikes: Arrayan circuit, Cerro Chapelco, Quila Quina. At Quila Quina, we board a boat for a 30 minute trip back to town. The day begins with a journey to the entrance of Lanin National Park, where you will pick up your bike headed towards Pucón. 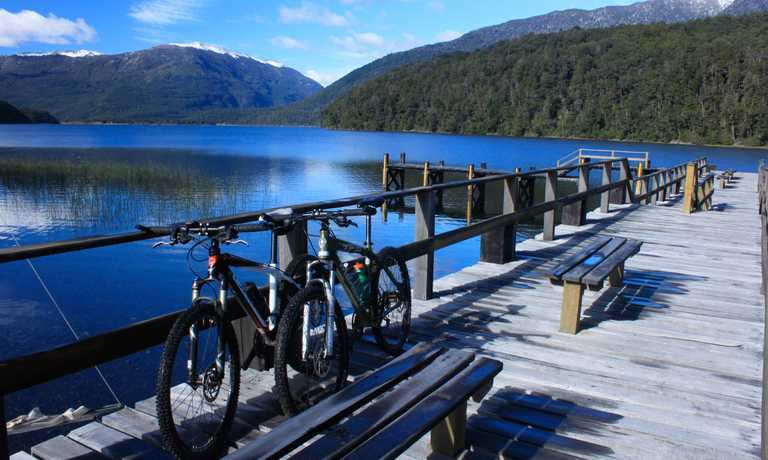 You'll ride towards Curruhue grande lake, passing Lolog lake, Curruhue Chico lake and Verde lagoon. Then follows a far-stretching descent through the woods of Pehuen forest (Araucarias). The landscape becomes more leafy as you ride alongside incredible rivers and green meadows. Getting closer to Pucón, discover a new cone, the Villarrica Volcano with its steaming crater. Spend the night in Pucón. Enjoy a day off of your bike and choose from a range of optional excursions - try white water rafting, visit the hot springs, explore the city, hike the Villarrica Volcano, or take in all the scenery by the lake shore. 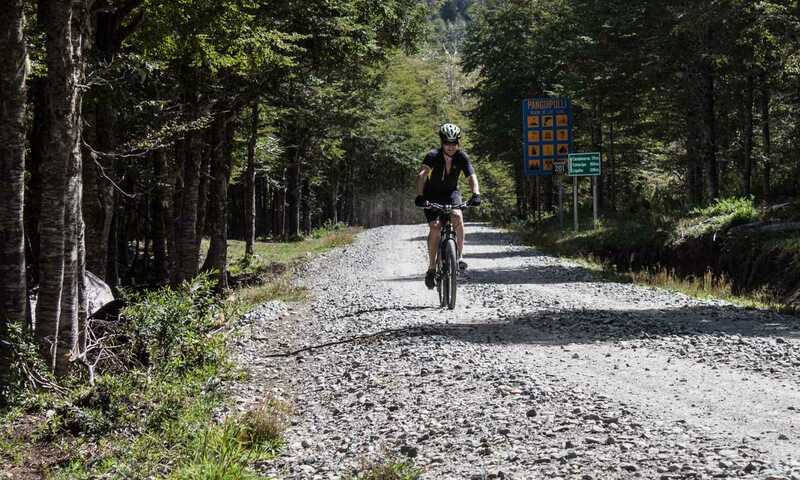 Set off on your bike again, this time starting with an uphill cycle into the Villarrica National Park, between Villarica and Quetrupillán Volcanoes. Then, continue the uphill journey into the dense Andino-Patagónico forest. The challenge of this part of the route is met with great delight as you marvel at the land, volcanoes and araucaria ('monkey puzzle trees') forests. After completion of this stunning transvolcanic route, you will arrive in the town of Coñaripe. Spend the night at a hostel here. A shorter journey today, begin your journey westward for a few kilometres and then head south, riding on the shores of Neltume Lake with stunning views. Lunch by the shore of this lake with views of two more volcanoes, Mocho and Choshuenco. To end the day, you'll bike about 15km, mostly uphill, reaching the shores of Pirihueico Lake and the hotel here. Distance: 55 km + 2 hours boat ride. 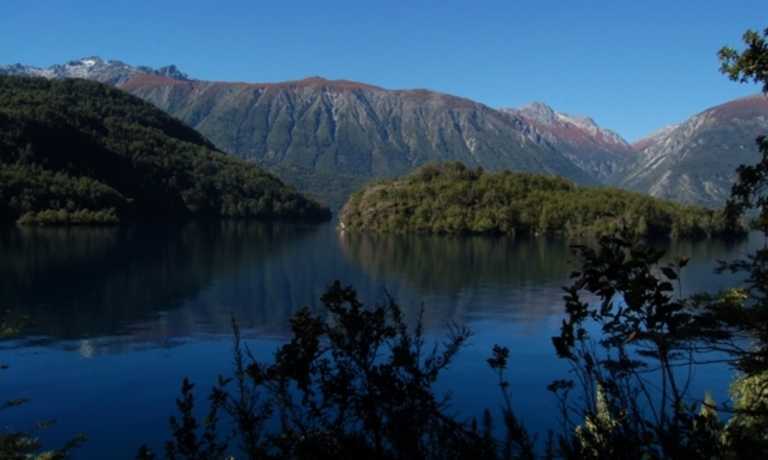 Just a few meters from your hotel awaits the boat transfer to Pirihueico lake. The boat ride takes around 2 hours, with views of the rainforest that covers all the surrounding mountains. 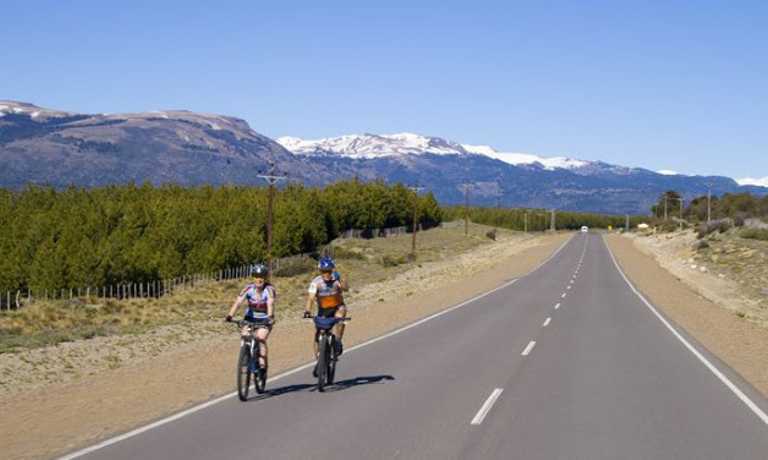 Back on land and once on your bike you'll cross the border and we continue for about 54km to San Martín de los Andes. Price from USD $2294 per person, based on a group of 6 or more people. Please note that groups only confirm with a minimum of 6 people. This trip can run as a group trip, with prices starting from $2,294 per person for a complete group. If you are looking to join a group or you are a solo traveller we will help to form likeminded groups of travellers. Please let us know your travel plans.